The Heat, a female buddy-cop movie starring Melissa McCarthy and Sandra Bullock, made $40 million in its opening weekend, but is one of the few movies in recent history with female leads. Summer is the perfect time for a night out at the cinema, but maybe you’ve noticed something missing at the movies: women. Women make up a minority of movie creators: 7 percent of directors, 13 percent of writers and 20 percent of producers; that’s nearly five men for every woman working behind the scenes. Out of last year’s biggest movies, 28 percent of speaking characters were female. That’s down from a third just five years ago, according to the Annenberg School at the University of Southern California. That’s not to say no women are making and having lead roles in films, recent examples include Sofia Coppola’s Bling Ring and The Heat, which opened this weekend and stars Melissa McCarthy and Sandra Bullock. The Heat was also written by a woman, Katie Dippold. Today, September 15th kicks off Hispanic Heritage Month (although this Latina celebrates her ethnicity every day 🙂 ) and my heart is full by seeing so much content spread across the internet in honor of Latinos. 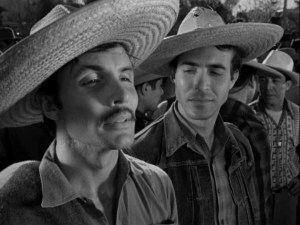 A topic I’ve been trying to write about but haven’t had the time to discuss is the contributions of Hispanics and Latin American countries and filmmakers present in film noir. Robert Schwartzman has just begun shooting his directorial debut, a film entitled MF. He’s mum on the logline, but his stars are Johnny Simmons, Amy Landecker, Frankie Shaw and Beverly D’Angelo. Schwartzman, who has fronted the L.A. band Rooney for more than 15 years, wrote the script with Benjamin Font. He’s producing with Mel Eslyn. His previous association with films was limited to composing original music for Palo Alto. He’s also done acting work in The Princess Diaries and The Virgin Suicides. And of course, he’s the son of the great Talia Shire of Rocky and The Godfather fame and part of the Coppola clan, so this directing thing was probably in the genes. ICM Partners, which reps Schwartzman, packaged the film and will handle domestic rights. Five months after his last feature, Noah Baumbach is back with Mistress America. The release comes on the heels of his While We’re Young, released by A24 in March. Mistress America, starring Greta Gerwig (Baumbach’s 2013 France Ha), will be joined by a hefty slate of newcomers this weekend. Music Box Films opens Sundance Audience Award-winning documentary Meru, and Film Arcade will roll out People Places Things in a slew of locations Friday. Orion is opening the summer-centric Fort Tilden in a day-and-date release, and Vice and FilmBuff are teaming on the Berlin premiere Prince. And Fox International Productions bows its Bollywood title Brothers: Blood Against Blood in India, North America and other territories. It’s no secret that studying films can improve your own filmmaking, but which ones should you watch for maximum educational impact? The obvious answer to that question is that you should watch the great ones, the films that have left an indelible mark on the history of cinema. It makes sense, right? If you want to be the best, you have to study the best. While that may be partly true, exclusively watching well-crafted films might not actually be the best use of time if your intention is to become a better filmmaker.